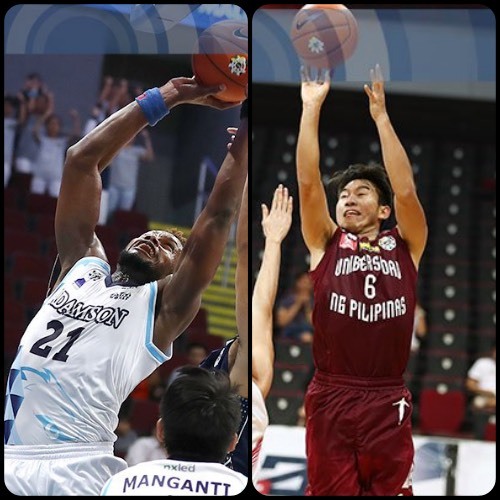 Hoop Nut #UAAP79 Adamson NU UAAP UE UP #UAAP79 Roundup: Maroons beat Warriors and Falcons silence Bulldogs on Day 8! Images from Arvin Lim/ABSCBN Sports. Day 8 saw the UP Fighting Maroons finally break into the win column at UE’s expense even as Adamson outshot the NU Bulldogs! 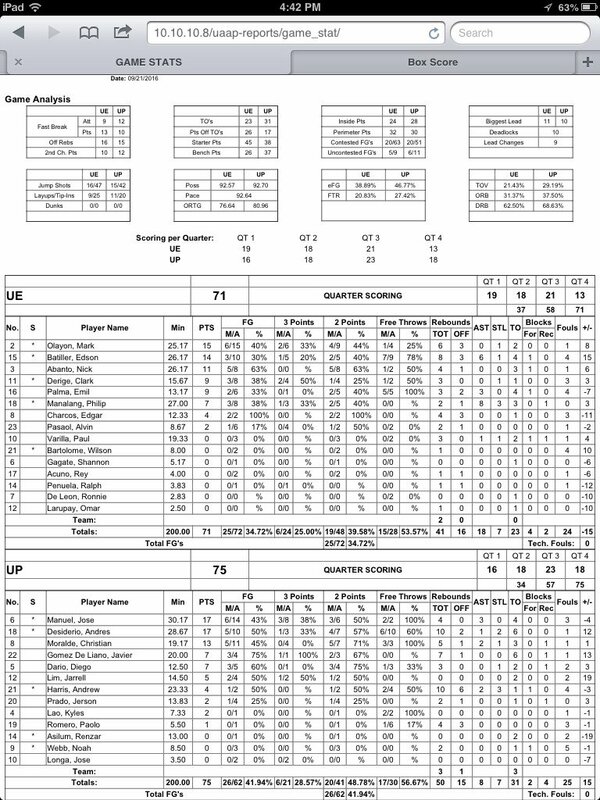 The UP Fighting Maroons picked up its first win of UAAP Season 79 after a strong showing against UE, 75-71, on Wednesday at the Mall of Asia Arena. Jett Manuel and Paul Desiderio each had 17 points to lead UP, which improved to 1-3 for the season while keeping the Red Warriors winless at 0-4. Manuel hit three three-pointers while Desiderio grabbed 10 rebounds and two steals to go with his scoring output. 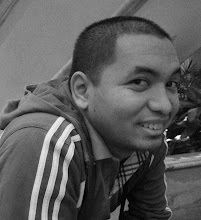 Dave Moralde added 13 markers. Paul Desiderio (UP) - 17pts, 10rebs, 2stls, 1ast, 1 triple, 5/10 FGs. BonBon Batiller (UE) - 14pts, 8rebs, 6asts, 1stl, 1 triple. 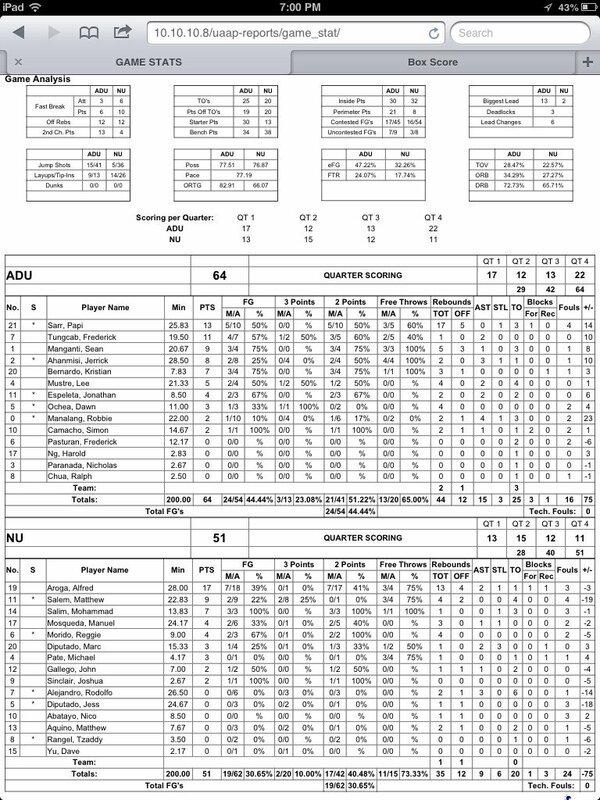 The Adamson Falcons continued their winning ways after defeating NU, 64-51, to move into second place in the UAAP Season 79 standings on Wednesday at the Mall of Asia Arena. Papi Sarr led Adamson with 13 points and 17 big rebounds in the win. The Falcons are now 3-1 for the season, trailing only La Salle (4-0). JD Tungcab added 11 markers and Sean Manganti chipped in with nine to make up for a subpar showing from scorer Jerrick Ahanmisi. Ahanmisi struggled for the first time in his UAAP career, scoring just eight points on 25-percent shooting. He did score seven of those in the last two minutes, though, as he helped preserve the win for his team. Adamson finished the game strong, closing out with 11 unanswered points to end the contest. Papi Sarr (ADU) - 13pts, 17rebs, 1stl, 1blk, 5/10 FGs. Alfred Aroga (NU) - 17pts, 13rebs, 2asts, 1stl, 1blk.